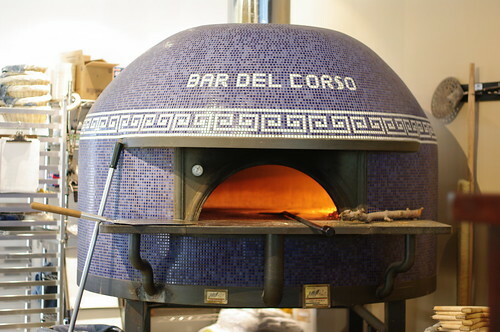 Bar del Corso is a relative newcomer to Beacon Hill, replacing an old-school bar in the neighborhood. Although I didn’t see the original incarnation, from the description given by my dining companions who had known it previously, I can imagine all of the work they had to do to exorcize the grease and smoke and transform it into the light, airy space it is now. You’ll want to show up early, as it’s a popular place. My cousin, a Beacon Hill resident, tells me that it’s a restaurant with grassroots support and the steady stream of customers from the 5pm opening until we left after 8pm backed that up. Come early or just with two, or you’re likely to wait half an hour or more. Once inside, it’s one big room, with the dining area off to the left and to the right a long bar with substantial seating, a good place for drinks and snacks or a full-on meal. A straightforward interior, with this enormous pizza oven in the back, hardwood floors, Shaker chairs, and schoolhouse lighting fixtures. We started with the very flavorful Vongole alla Marinara: Manila clams, garlic, hot peppers, olive oil, cherry tomatoes, white wine, and parsley. 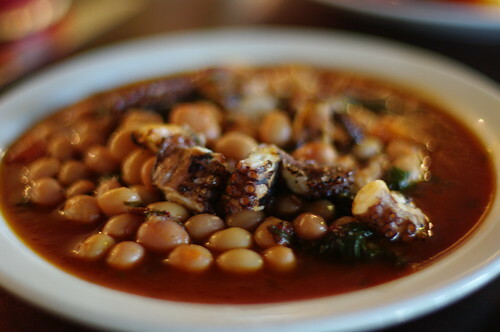 Then on to the special of grilled octopus and borlotti beans, with kale, yellow tomatoes, and red tomatoes. (The gorgeous photo below is a version of what we had that night, though not exactly the same.) The octopus was well cooked (read: not overcooked) and I liked the various textures of the dish, though it was quite soupy and I felt like I left half the flavor on the plate. Maybe too liquid to have been served on crostini, but I was pining for some bread on the side to sop up the goodness. I know I’m not supposed to want bread with pizza on the way but I’m greedy that way – when something is this delicious I don’t want to leave anything behind. It’s Neopolitan pizza so not crispy, but a wonderfully doughy texture with just the right salt quotient for me. We tried the Margherita (tomato, mozzarella, basil, olive oil) and added mozzarella di buffula which I hear was just the right addition. But it was the Funghi that was my favorite, with crimini mushrooms, cherry tomatoes, housemade sausage, pecorino, and fontina. Spicy and a ton of flavor. I’d definitely return for the pizza, but also for a sampling of what looks to be an interesting selection of meats and cheeses. Arugula and fresh fig salad with gorgonzola naturale – yum!